Constructed from 304SS or 316SS, these housings can either accept cartridge or bag filters as needed for varying specifications. 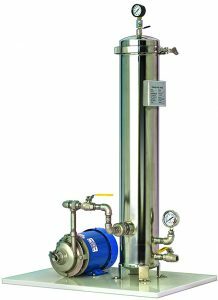 Filter Pump SS Filter Systems feature a band clamp closure that makes cartridge/bag change-outs quick and easy. The vertical sealless pump series PSS is offered along with horizontal centrifugal pump with single seals or optional “HK” Double Seal arranged with a thermal transfer oil-filled seal chamber where oil lubricates and cools the mechanical seals. The “HK” feature eliminates continual flush water from entering the waste stream. The pumps’ Seal Expansion Chamber provides a cavity with an air space to expand into during the pump operation. Available with Silicon Carbide stationary seats for improved hardness, wear resistance, and superior thermal properties over the older Ceramic components. Filter Pump’s quality workmanship and design assure superior, consistent and reliable performance!